Quite apart from the impact of government-by-Twitter, the United States alliance with South Korea has been under continuous pressure since its inception. In 1950 alone, the two worked together to repel a North Korean invasion, occupy North Korea, repel a Chinese invasion, and solidify a main line of resistance against communist forces. That foundation of blood and territorial sacrifice has never been questioned for its importance, but the meaning of the past waxes and wanes when it comes to navigating new geopolitical alignments. For those American officials whose focus is East Asian security, Washington’s decisions to remove troops from Afghanistan and Syria have been unwelcome. Lindsey Graham, who serves on the Senate’s Armed Services Committee, raised concerns over the implications of Syrian withdrawal in so far as it might send totally the wrong message to Pyongyang about America’s commitment to South Korean security. The populist platform of the current US administration notwithstanding, dramatic shifts in the US’s military posture in East Asia would appear to go against the wishes of a large part of the American voting public, too; there, support for the ROK-US alliance remains solid. More recently, the rise of China appears to have given Americans a renewed sense of appreciation for Washington’s alliance with Japan. While a US drawdown in Korea would reduce American preparedness in dealing with a crisis situation, a decreased US military commitment could boost the interests of Washington’s main competitor in East Asia. Japanese diplomat and Atlantic Council visiting fellow Taisuke Mibae asserts that China’s medium- and long-term goal is to eject the US military from the Korean Peninsula in order to gain a strategic advantage over the US. After nearly two decades of focusing on terrorism and unconventional warfare, Washington’s defense establishment appears to have returned to an emphasis on the prospect of competition with China and Russia. Concern in Beijing over Americans and their allies being so close to the Chinese periphery is understandable. But the situation is complex. Of late, South Korea has shown a degree of independence vis-à-vis the US position. Conversely, Tokyo’s stance in Northeast Asian geopolitics coincides with that of the US. Of course, South Korea is particularly badly exposed toChina, as the effects of the THAAD crisis on South Korea’s economy demonstrate, and is keener not to upset Beijing than Japan. American missile defense: a common thread in the US alliance network | The United States’ alliances with Japan and South Korea together have allowed the US to project missile capabilities (ostensibly deployed to deter North Korea) near the Chinese periphery. Since 2017, South Korea has hosted the US Army’s Terminal High Altitude Area Defense (THAAD) system, while the US Navy’s Aegis Ashore is slated for deployment in Japan from next year. American missile defense systems in East Asia have largely been tailored toward threats from smaller states in a regional context. Technologically, THAAD is designed to intercept short- and medium-range missiles from North Korea. Legally-speaking, Japan-based missiles are allowed to operate only against external threats to Japanese territory (although Japan-based radar can be used to track threats not directed against Japanese land). Nevertheless, these problems are political, not legal, and Beijing has never really accepted the US argument that the aforementioned missile defense systems are for the sole purpose of deterring North Korea. The ostensible mutual threat that THAAD poses was no doubt behind the December 2017 joint missile defense exercises between the Chinese and Russian militaries. Indeed, even as Seoul and Tokyo’s decisions to host American missile systems were born out of concern for a common sub-regional threat, American missile deployments have raised the stakes in the regional context of US ties with China. Great power contention: Seoul and Tokyo’s differing positions | In 2005, Tokyo and Washington clarified the nature of the Japan-US security partnership in light of post-Cold War realities. At the core of the Japan-US alliance is the challenge to Japanese and US interests that China and the DPRK simultaneously pose. This basic structure has not changed under the Trump administration, and, if anything, the broadening of the frame into the “Indo-Pacific” has strengthened these traditionalist impulses. As the US State Department’s fact sheet on Japan-US relations states, the scope of Tokyo-Washington cooperation extends across the wider Indo-Pacific. Japan and the US, along with Australia and India, form the so-called “Quad”, which exists in part to balance against China. The ROK-US alliance, for its part, remains centered on protecting the Republic of Korea’s sovereignty against external threats. In the fall of 2018, then-Secretary of Defense Jim Mattis and his South Korean counterpart Jeong Kyeong-doo signed a set of guiding principles on the future of the alliance. The document includes provisions how the ROK-US defense partnership would function in light of the Blue House’s conciliatory policy toward the DPRK, as well as promising the continued deployment of American troops in Korea while simultaneously pushing for ROK wartime command of its armed forces. The Moon Jae-in administration’s outreach to Pyongyang has to an extent also influenced South Korea’s military posture. The 2018 edition of the ROK Ministry of National Defense’s White Paper refrains from explicitly labeling the DPRK as an “enemy” (though Seoul’s defense budget has risen markedly at the same time). The ROK Between Hard Power and the Power of the Purse | To say that South Korea has been feckless in its alliance with the US, at least in the context of Sino-American tensions, would be unfair. Rather, South Korea finds itself in the unenviable position of having to balance between reliance on China economically and the US for its defense. 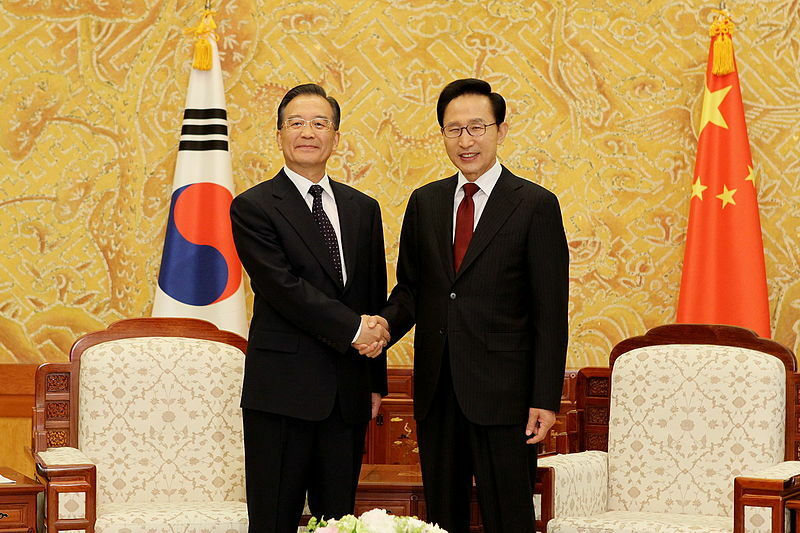 Since 2008, the Sino-South Korean relationship had been labeled a “strategic cooperative partnership.” Having assumed the South Korean presidency in the middle of the Beijing-Seoul discord over THAAD, one of Moon Jae-in’s first priorities was repairing the Sino-South Korean relationship in the form of a “reset”. During the first summit between Moon Jae-in and Xi Jinping, Moon attempted to defend the importance of THAAD for South Korea’s security. At that time, the THAAD issue was not directly mentioned, but was labeled as the “reason that everybody knows” for the deterioration of China-ROK ties. Nevertheless, Moon also asserted that Seoul’s own economic plans were compatible with China’s “One Belt, One Road” framework, and that the ROK government wanted to collaborate with China economically. The feeling of push-pull between China and the US is not limited to the political elites in Seoul, but also extends into public opinion. South Korean citizens on opposite ends of the spectrum on any given political or security issue have occasionally insinuated that their political opposite numbers have obsequious or sycophantic tendencies toward either China or the US. In 2016, for example, some columnists accused South Koreans who opposed THAAD’s deployment as being “pro-Chinese” and engaging in sadae (Korean: 사대), a term that refers to Joseon’s subservient tributary relationship with China. In return, opponents of THAAD accused those supporting the missile defense system’s deployment in Korea as being excessively pro-American. South Korea’s entrapment between China and the US is not problematic only for Seoul, but for Washington as well. In what appears to have been an attempt to help anchor the ROK more firmly in the US alliance network, on the very last day of 2018 the US Congress passed the Asia Reassurance Initiative Act of 2018. Section 206 of that law declares that the US should push for closer trilateral cooperation with Japan and South Korea in fields such as intelligence sharing and missile defense. Such legislation, made from a comfortable distance on Capitol Hill, will nevertheless run into harsh on-the-ground realities. Chapter 3, Section 2 of the 2018 U.S.-China Economic and Security Review Commission’s annual report highlights that in the face of Chinese pressure, Seoul capitulated to the so-called “three no’s”: no more additions to the THAAD system currently in South Korea, no trilateral alliance with Japan and no direct ROK participation in the US’s missile defense network. Conclusion | Agreement between Seoul and Washington over how best to manage relations with the DPRK has been a source of strain for the ROK-US alliance. Yet another major test for the strength of the South Korea-US security pact may manifest itself in how South Korea navigates its position between China and the United States. Given the ROK’s vulnerabilities, any great power contestation in Northeast Asia will likely put Seoul’s alignment with Washington to the test. Developments concerning the DPRK notwithstanding, when the US chooses to view its large-scale military deployment on the Korean Peninsula in geopolitical term, the ROK-US alliance becomes an asset in competition with China. South Korea will not want to be forced to choose sides between Beijing and the US. Just as countries – including China and Russia – have pursued policies of “equidistance” between the DPRK and South Korea, so the ROK may be forced, in the name of preserving its sovereignty and middle power status, to occupy a balanced position between Beijing and Washington, the better to navigate a middle course in Sino-American tensions. 백영서 (Baek Yeong Seo) “역사적 관점에서 본 한중관계 25년: 성과와 과제 [25 Years of Korea-China Relations in Historical Perspective: Achievements and Challenges]”, ROK Ministry of Foreign Affairs, 2017.